The PERFECT fall read. Samatar's elegant prose will make the glittering landscapes of the world inside these pages as feverishly real to you as to the novel's haunted protagonist. This is a book for bibliophiles, for people that read closely and dream widely: love for literature and how it influences our perceptions of the world (for better or for worse) is one of many themes subtly and intriguingly addressed here. Samatar is an incredible writer and the plot of a naive young man drawn into matters over his head will speak to anyone whose travels have made them both sick with excitement and the longing to go home. If Ursula K. LeGuin or Cathrynne Valente are favorites of yours, you will love this book. Sofia Samatar is an American of Somali and Swiss-German Mennonite background. She wrote A Stranger in Olandria in Yambio, South Sudan, where she worked as an English teacher. She has worked in Egypt and is pursuing a PhD in African Languages and Literature at the University of Madison, WI. 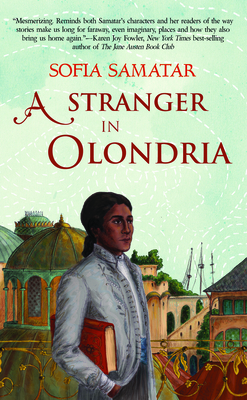 "Samatar's sensual descriptions create a rich, strange landscape, allowing a lavish adventure to unfold that is haunting and unforgettable."